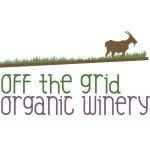 Off the Grid Organic Winery is a family owned 5th generation winery. Off the Grid features a straw bale building, solar power, and goats living on the grass roof. Picnic area, yoga and events are offered.